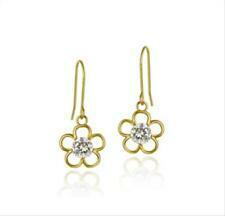 These dainty dangle earrings each feature a delicate flower with a 4mm round CZ stone in its center. 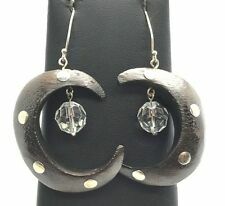 The earrings are crafted of 10k gold and are secured with fishhook backs. If the item you receive is not as described you get your money back. 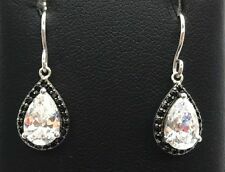 These drop earrings each feature a 7x7mm diamond shaped CZ stone. 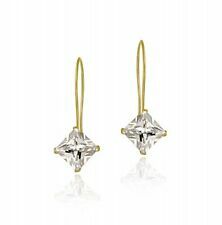 Earrings are crafted of 10k gold and are secured with fishhook backs. Chain Type Stone Weight Shape: diamond-shape. You must complete your order using the CheckOut process. These Pair Of Earrings are 100% Handmade Work And Produce On Greece From Small Family Laboratory With Over 100 Years Tradition & Experience on Silver Jewellery. Most Of Them Has 2 Hallmarked One is 925 For Silver & Other is Laboratory Code Numbers Due A Strict Rules Of Greece For Quality Standard. WE WILL ALWAYS WORK WITH YOU TO MAKE THINGS RIGHT. 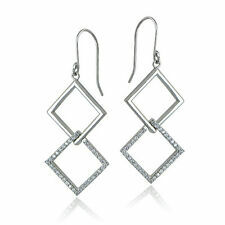 These cubic zirconia double square dangle earrings are finely crafted sterling silver. If the item you receive is not as described you get your money back. You must complete your order using the CheckOut process. Sparkling Pink CZ Dangle Earrings set in Tarnish Free Rhodium plate over Sterling Silver. Feel beautiful and fabulous. Clasp Type Chain Type Color: pink. You must complete your order using the CheckOut process. A bold bezel setting borders a breathtaking Diamond cz stone in these simply elegant lever back earrings. Chain Type Stone Weight Shape: round-shape. You must complete your order using the CheckOut process. Adorned all-over with CZ for sparkle and drama. Set in Tarnish Free Rhodium plate over Sterling Silver. Stone Weight If the item you receive is not as described you get your money back. You must complete your order using the CheckOut process. These stunning earrings display an infinity heart design; symbolizing everlasting love and devotion. The earrings are crafted of gold tone over sterling silver, and secured by fishhook backs. You must complete your order using the CheckOut process. These stunning earrings display an infinity heart design; symbolizing everlasting love and devotion. The earrings are crafted of sterling silver, and secured by fishhook backs. If the item you receive is not as described you get your money back. These Beautiful Dangling Earrings are crafted of Sterling Silver. Hearts are Diamond cut which gives it a remarkable glitter! Very pretty and Stylish! You must complete your order using the CheckOut process. Royal Blue stones sparkle from the center of silver crosses that dangle softly from fishhook backs. Chain Type Stone Weight Shape: round-shape. Color: blue. You must complete your order using the CheckOut process. A Sparkling Pink cz Heart dangles attractively from an intertwining textured Silver Hoop Design. Color: pink. You must complete your order using the CheckOut process. If the item you receive is not as described you get your money back. Earrings sure to add vibrant magnificence to any outfit Pink cz briolette cut stones sparkle with breathtaking beauty from sleek silver backs. (A Briolette cut stone has its entire surface cut in triangular facets giving the stone an extra sparkle.). Delicate CZs sparkle from slender Diamond shapes in these elegant earrings. You must complete your order using the CheckOut process. If the item you receive is not as described you get your money back. 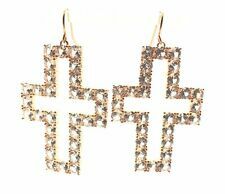 These earrings feature CZ stones sparkling in the center of the crosses. They are crafted entirely of sterling silver, and are secured by a fishhook back. Chain Type Stone Weight Shape: round-shape. Sparkling Red cz disco balls add a splash of vibrant color to any outfit. Shape: round-shape. Color: red. If the item you receive is not as described you get your money back. Back Finding: fishhook. 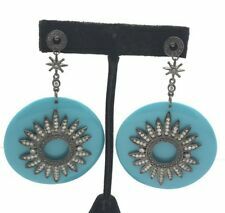 Earrings sure to add vibrant magnificence to any outfit. Olive green cz stones sparkle from sleek silver backs. Color: green. If the item you receive is not as described you get your money back. You must complete your order using the CheckOut process. (A Briolette cut stone has its entire surface cut in triangular facets giving the stone an extra sparkle.). If the item you receive is not as described you get your money back. You must complete your order using the CheckOut process. The Earrings Are 100% Handmade Work And Produce On Greece From Small Family Laboratory With Over 100 Years Tradition & Experience on Silver Jewellery. Most Of Them Has 2 Hallmarked One is 925 For Silver & Other is Laboratory Code Numbers Due A Strict Rules Of Greece For Quality Standard.